Those with attics in their home are aware of how important an attic vent is, especially to those homeowners that live where snow and ice occur. Attics are notorious for trapping heat and moisture and if no attic vents are installed the home may begin to show early signs of wear and tear. The attic is located at the top of the home and the covering of the attic would be the roof. When heat and moisture spend large amounts of time in an attic, the roof can become damaged resulting in the homeowner shoveling out large amounts of money in roof repair jobs. In some areas, new laws have been passed forcing homeowners to have some form of attic ventilation; the important thing is to keep the attic ventilation system in good repair. 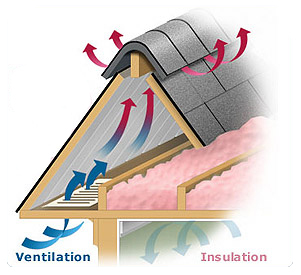 Without proper attic ventilation, energy costs can go through the roof (literally) as well as the shingle on the roof will begin to decrease in life expectancy. A properly ventilated attic will prevent high temperatures from residing in one place to long and will work to cool off the attic temperature decreasing the chance for mold to grow and spread. Everyone needs a way to save money during this tough economical time the world is in, installing an attic vent, is one way of lowering ones living expenses. During the summer, the heat from the attic will cause a home to run more energy to properly cool the house down; in the winter, a poorly ventilated attic would force energy costs through the roof as the home’s heating system fights to warm the attic space. Since no one loves high energy bills, the time is worth spent making the needed repairs or adding additional attic vents. To ensure the longevity of your roof, equip your attic with a top quality attic vent from FAMCO, knowing their products always get the job done effectively and efficiently.